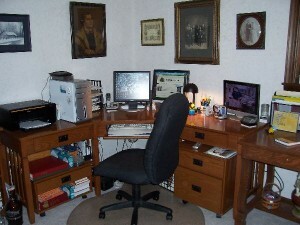 2012 Goal: Keep office organized and neat. It is here–another New Year and the time to make those dreaded resolutions. After all these years I am not going to stress out about making New Year’s Resolutions that I probably won’t keep anyway. I basically have the same resolution each year: to lose weight. Some years I succeed while the opposite happens other years. In addition, I have two on-going goals that I have had for many years: Discover when Isaac Huey died and where he is buried. Discover who Jackson Brewster’s parents were. Maybe I will have success in 2012. I am a list maker and always have many lists going at once. I have the long-term list (things to accomplish in a year), the medium-term list (to accomplish within a couple months) and the short-term list (to accomplish within a week). I keep my lists on the ColorNote Notepad app on my phone. ColorNote is an Android app that also syncs with my Kindle Fire. I keep shopping lists on that app, too. It is very handy and easy to use. I also do low-tech. I have many little pieces of paper with to-do items on them. I am always writing down things while at work and stuff the paper in my pocket. This system works well until a list goes through the laundry. Is that what they call a laundry list? I can now check off one item on my short-term list since I have finished Friday’s blog. Great job, I don’t know how you got that much done. Have enjoyed your postings. Digitizing those home movies sounds interesting as I might consider doing my old 8mm and Super 8’s. I hope you acheive all your goals this year, but am glad to hear that I am not the only one that has goals and list that do not get done. 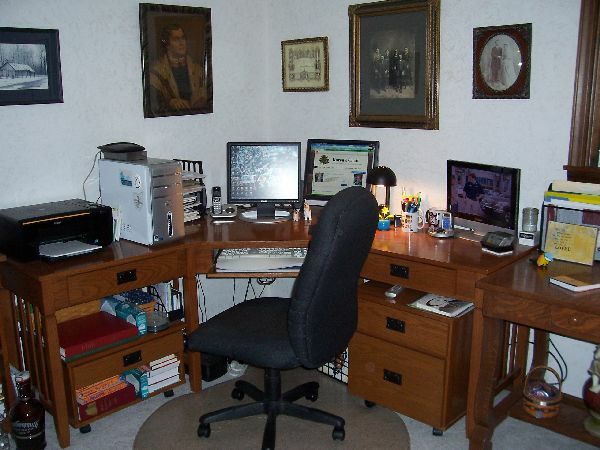 Love the picture of your office – it looks like a comfortable place to do research!